It’s been a busy few months for us at Harbour and we’ve now got a total of 445 visitors, with an average of 48 visitors coming every day. We’re pleased to say, with the help of our amazing volunteers, a total of 986 help and advice sessions have been given in the last quarter. 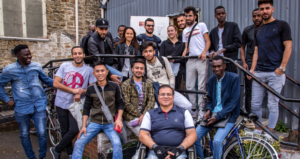 Looking back over 2018, we saw 547 visitors coming through our door at some point: we had 190 new arrivals (114 male and 76 female) from 32 different countries. 71 of our visitors were granted Leave to Remain during the year. So if you are one of our volunteers and sometimes wonder why you can’t always remember everyone’s name, it’s because you’ve met a lot of different people over the course of a year! As in recent years, Volunteers opened Harbour’s door for refreshments and socialising between Christmas and the New Year, while staff took a well-earned break. Over three days, a total of a dozen or so Volunteers chatted and shared experiences and laughter with around visitors – we were introduced to new styles of music, we played and taught each other card games and board games from different countries, and we got through a fair bit of generously provided biscuits, cake, mince pies, chocolates etc. 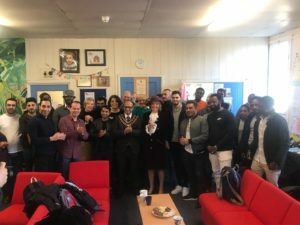 And we were delighted to be able to offer a Harbour Welcome to an Asylum Seeker who had just arrived in Swindon and was kindly brought by a housemate for his first visit on New Year’s eve. We are delighted to be one of the Mayor’s Charities for 2018/19. So far, he has ran a half-marathon for us and hosted 3 curry nights, we are extremely grateful for his support! More of his upcoming events include the Mayor’s Mela, on 14th April in GWR park in Faringdon Road. As noted by the Swindon Advertiser, it will be great to see all of Swindon’s communities coming together for this event. Additionally, on the 24th April Junab will be doing a ‘Mayor’s Marathon’ taking on the epic challenge of running a marathon – that’s 26.2 miles, across Swindon in 8 different locations, to raise vital funds for all three of his charities.. If you are interested in supporting the Mayor’s Marathon you can donate via LocalGiving. The Mayor isn’t the only official showing their support to Harbour recently. On Friday 22nd February we were honoured to receive the High Sheriff Award from Wiltshire’s High Sheriff, Nicky Alberry, who came wearing her Court dress. After her initial visit to the Harbour in September 2018, it was great to greet her again and this time with an award! Joined by Swindon Mayor, the presentation of the award was a very proud and special moment for everyone at Harbour; staff, volunteers and visitors. We are extremely appreciative of everything she’s done and for promoting our work in the community, as well as the Mayor’s continued support. Harbour on Tour Takes Bristol! After the gloomy winter weather, we’ve started the year with a return of Harbour On Tour! Recently 15 visitors enjoyed a day trip to Bristol, visiting Bristol Aquarium, the Wildlife Photographer of Year Exhibition and the Clifton Suspension Bridge. Harbour On Tour trips are valued highly amongst our visitors, giving the opportunity to experience local attractions outside the ongoing asylum process and dedicated learning in The Harbour English classes. We wouldn’t be able to do this without our lead volunteer Paul who comes up with lots of fabulous trip ideas and single handedly takes a group touring around local attractions. We also couldn’t run these trips without our funders and donors so thank you to Yorkshire Building Society who’s funding will cover around 4 Harbour On Tour trips! With core funding for some of our activities and trips coming to an end, we are having to search for more money to ensure we can keep providing our visitors with a range of experiences. Exciting fundraising news includes our new ‘share your birthday’ campaign via Facebook. 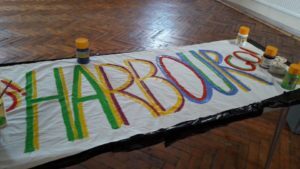 If your birthday is approaching why not kindly swap your gifts for donations to the Harbour Project? This has become easier than ever through Facebook, where it is automatically shared to your friend’s list. But the fundraising fun doesn’t stop at birthdays, you can fundraise for us using Facebook for any type of event! In the past we’ve had fundraising in all shapes and sizes including jewellery making, church collections and sporting challenges. We are here to help, we can help with promotion (we have 1800 people following us on Facebook, plus our bi-monthly Newsletter and daily volunteer briefings), help to set up Local Giving pages, we can help with ticket sales and we provide you with collection buckets, posters, information leaflets and bunting. If you’re interested in taking on a challenge, or you want to fundraise for Harbour in other ways, feel free to contact the office to find out more information. Following this we are pleased to announce Sarah Wolferstan is taking on the mighty trek of the Brecon Beacons in aid of the Harbour Project. With a family connection to starting new lives in the UK, Sarah has chosen to fundraise for us with the aim of allowing other families to do the same. You can find out more about Sarah’s challenge or donate here. 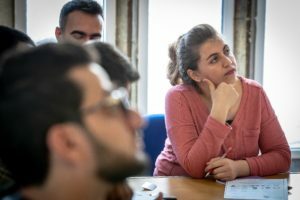 In January 2019 another 2 members of staff took part in Level 1 OISC Asylum & Protection training through Refugee Action. So we are proud to be OISC L1 registered this allows us to speak to Home office and sign off travel documents. This makes certain processes quicker and more efficient for our visitors. Steps2Work is back with a new course, which focuses on preparing visitors for work life in the UK. The course content includes information about CV’s, work do’s and don’ts as well as concluding with practice interviews at the end, with some of Swindon biggest employers. These valuable lessons aim to give visitors more understanding of work in the UK along with more confidence when applying to jobs. We currently have 5 dedicated volunteers who are helping to write profiles and CVs, skills matching and job hunting. If you are an organisation who would like build a relationship with Steps2Work Harbour please find out more information about the benefits of offering volunteer or job opportunities through: steps2work@harbourproject.org.uk. The Harbour is fortunate to be supported by incredibly generous groups and individuals. It isn’t rocket science to know that public trust is vital for such support. Trustworthy behaviour is not easily quantified but is fundamental. This is one reason why, although it may seem overly bureaucratic, we regularly review our policies and procedures to meet them, and ensure they are underpinned by appropriate training. The training session on Unconscious Bias run for The Harbour by Tamarisk Training on 10th December was thought-provoking and salutary, but also fun. It helps us realise and consider: how we may make completely unjustified assumptions e.g. about the actions and motives of others; how we may identify as ‘groups’; and how we feel as individuals when we cannot communicate to others our concerns or confusion. It also allowed exploration of issues around aspects of ‘control’ and ‘power’ that again we might not recognise, or choose not to recognise, consciously. With International Women’s Day coming up we thought you’d be interested to know we have recently introduced a weekly women’s group. This was after visitor feedback that mentioned our female visitors would value some ‘women-only’ time. 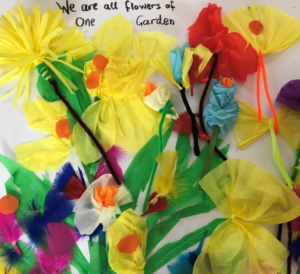 With the help of some lovely volunteers this weekly group provides a safe place for the women of Harbour to meet up away from the hustle and bustle of the drop-in and make new friends. In the past 6 weeks we’ve had a range of activities including knitting, felting and cake decorating. With many more activities in mind, we hope to continue running the group and the nice atmosphere it creates. Harbour’s monthly Free Shop doesn’t ‘just happen’. Behind the scenes, organiser Sarah Clements and helpers Gill Nye and Linda and Andy Harrison make sure the ‘shop’ is as welcoming and useful as possible for our Visitors. They collect, sort and arrange the stock, all of which is donated, as well as helping Visitors to browse and choose items in a relaxed and friendly environment. This includes ensuring that first-timers or those a bit less confident are enabled to obtain what they need. The Free Shop takes place on the first Friday of each month at 1 o’clock in St Luke’s Church Hall. If you can donate items and would like to be involved please contact Sarah on sarah.jane.clements@btinternet.com (or bring the donations direct to the Free Shop on a first Friday). Our Visitors don’t need dirty or broken items; so please ensure clothing, bedding etc is clean before donating. Many Visitors like to look stylish, so smart as well as functional clothes are sought after. Also, because The Harbour lacks storage space, those bringing donations are kindly asked to take away any items that are left when the Free Shop finishes at 2 o’clock. Thank you! 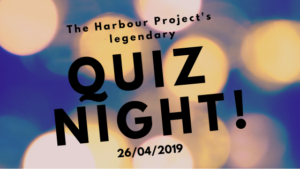 Other news includes the return of our legendary Quiz Night on 26th April! Tickets are now available to buy, so make sure to get your teams back together and compete to be this year’s champions. Hosted again by masterminds Tim and Eric, it’s a quiz not to be missed. Your ticket also includes a top notch supper of fish and chips from the famous York Road chippie. Feel free to bring your own snacks to keep you going and of course our HarBAR will be on hand to quench your thirst throughout the evening. Teams are made up of 8 but if you haven’t got enough people we can put you together. The last couple of years have sold out, so make sure to get your tickets soon as we won’t be selling any on the door. Get yours here.